Georg Guillemin's visionary approach to the work of Western novelist Cormac McCarthy combines an overall survey of McCarthy's eight novels in print with a comprehensive analysis of the author's evolving ecopastoralism. Using in-depth textual interpretations, Guillemin argues that even McCarthy's early work is characterized less by traditional nostalgia for a lost pastoral order than by a radically egalitarian land ethic that prefigures today's ecopastoral tendencies in Western American writing.The study shows that more than any of the other landscapes evoked by McCarthy, the Southwestern desert becomes the stage for his dramatizations of a wild sense of the pastoral. McCarthy's fourth novel, Suttree, which is the only one set inside an urban environment, is used in the introductory chapter to discuss the relevant compositional aspects of his fiction and the methodology of the chapters to come.The main part of the study devotes chapters to McCarthy's Southern novels, his keystone work Blood Meridian, and the Western novels known as the Border Trilogy. 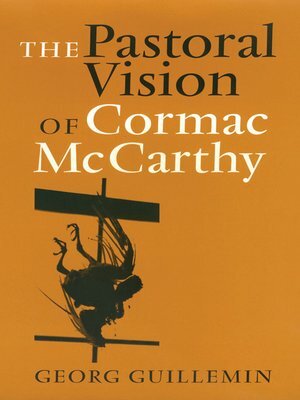 The concluding chapter discusses the broader context of American pastoralism and suggests that McCarthy's ecopastoralism is animistic rather than environmentalist in character.Guillemin shows that the very popular Border Trilogy takes McCarthy's ecopastoralism to its culmination, although this is often overlooked precisely because of the simplicity of the plots—picaresque quests. As the trilogy arranges its plots as a search for a life of pastoral harmony (All the Pretty Horses), envisions a nomadic version of pastoral (The Crossing), and experiences the foreclosure of the pastoral vision anywhere (Cities of the Plain), the trilogy as a whole tacitly acknowledges the obsolescence of utopian pastoralism. Increasingly, man ceases to be the dominant focus of narration, so that the shift from an egocentric to an ecocentric sense of self marks both the heroes and narrators of McCarthy's novels.